During one of the hottest Summers on record in the UK and Europe this year, much effort had to be made to keep our bonsai shaded and sufficiently watered, particularly as temperatures hit the upper 30°C mark. In addition to the need to keep the soil in bonsai pots from drying out, are there any other possible effects of heat on bonsai? Is there any possibility of longer lasting damage than a few scorched leaves on our Japanese Maples? Trees have optimum growing temperatures according to species varying from around 20°C to 30°C (70-85°F). Hotter temperatures can start to injure or even kill living tree systems. An upper temperature limit of around 45°C exists above which thermal death can occur in a tree. The exact upper limit is dependent on factors such as the duration of hot temperatures, the highest temperature reached, tissue age, water content of the tree tissue and the ability of the tree to adjust to the temperature change. Tree temperature is usually around or slightly above the ambient air temperature. Trees can dissipate enormous heat loads if allowed to function normally and have adequate soil moisture available to them. Heat is dissipated (lost or reduced) by release of heat into the air and primarily, through transpiration (water, and therefore heat, is released through the leaf tissues). Unfortunately, hot temperatures are also often associated with dry air/low humidity levels that cause the leaf stomata to close because of rapid water loss and this can greatly reduce transpirational cooling. When transpiration is limited by hot weather and bonsai are kept in low humidity areas (hard standing areas, patios etc) leaf temperatures may rise above the tree's thermal death threshold. An additional problem associated with rapid water loss and temperature increases in leaves is the delay in water uptake by the root system. Leaves can lose water/transpire much faster than roots can absorb water. This time difference can greatly amplify the effects of heat. Water shortages during the day are normally corrected by additional water uptake at night (assuming the soil is holding sufficient quantities of moisture). Night temperatures can therefore be critical for enabling the tree to rehydrate itself and recover from the daytime temperatures; however, if night time temperatures remain high and a high transpiration rate continues, the tree is unable to replace all lost moisture. This can then be fatal if high temperatures are repeated the following day. Wilting is the first major symptom of excessive water loss in the leaves. Leaves under heavy heat load may enter their dormancy cycle early (as though it were Autumn), browning and falling from branches. This effects the inner and lower leaves first and can be witnessed on field-growing trees such as Birch and Hawthorn after hot, dry Summers. Since Nitrogen is ordinarily physiologically demanding, even mild concentrations of Nitrogen fertiliser can damage trees that are under large heat loads. The normal processing of Nitrogen by a tree requires stored reserves to be used. If no new food is being produced by the tree due to high temperatures and accelerating transpiration, nitrogen feed should be withdrawn to avoid excessive use of the storage of foods in the root system. Heat stress problems also make trees more susceptible to pests and fungal attack. 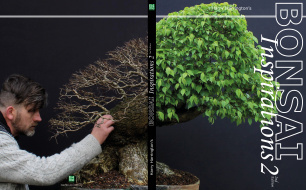 The loss of leaves and twigs, sunburn on branches and trunks, and root/shoot growth inhibition causes a loss of defensive capabilities and the opportunity for pests to effectively attack bonsai. The surface of the soil can be both a reflecting and an absorbing layer. In full sunlight, ground-soils can reach temperatures of up to 60°C (150°F). Within the confines of a relatively small bonsai container or black plastic nursery pot, this heat can easily cause enormous heat loading onto the roots and base of a bonsai. This heat can cause lesions on areas of the nebari and base of the trunk but more importantly can cause death of the fine or even major roots within the root system. The death of parts of the root system then exacerbate the effects of heat on the upper areas of the tree above soil level. Areas of burnt roots are easy prey to root-rotting pathogens. It is more than feasible to say that some cases of root rot could be found to originate from summer heat damage rather than over-watering. Place bonsai in a shaded position out of direct sunlight, alternatively make use of shade netting. Avoid placing trees on surfaces that will radiate excessive heat such as stone or cement flags. Keep air around bonsai humid to reduce transpiration. Mist both bonsai and wet ground around them. Ensure that additional watering is carried out so that the bonsai soil does not dry out. A heavy watering during the late morning will ensure the soil is still moist at the end of the hottest part of the day. It will also ensure that the tree is loaded with moisture in preparation for the increased transpiration during the hottest part of the day. Midday watering will also help keep the pots and roots cooler. Ensure that bonsai pots are completely shaded, if necessary by crowding trees together; this will also increase local humidity levels. Avoid using high/medium Nitrogen fertiliser's during prolonged periods of high temperatures.